[Via Satellite 07-10-2014] The Lockheed Martin-built third Mobile User Objective System (MUOS) satellite finished environmental testing at the company’s Dual Entry Large Thermal Altitude chamber. Lockheed Martin’s Vice President of Narrowband Communications Iris Bombelyn said the company is on track to deliver the satellite to the US Navy this year. Compared to legacy Ultra High Frequency systems, MUOS satellites provide a 10-fold increase in communications capacity. Each satellite carries a wideband code division multiple access (WCDMA) payload that makes use of commercial cell phone technology. The complete MUOS constellation is comprised of four operational satellites and one in-orbit spare. 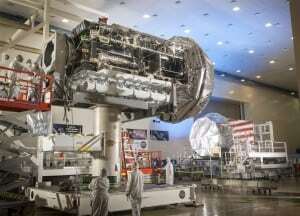 The Navy intends to launch this third satellite in January 2015. Lockheed Martin is the prime contractor and system integrator for MUOS.